Skunk2 Strut Tower Bar - Lightning Motorsports - Selling Speed since 1996 ! By tying in the upper suspension points at the shock towers, the strength and rigidity of the chassis increases while the overall handling performance of the vehicle improves. 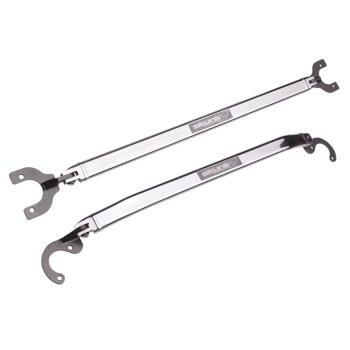 Skunk2 Racing Strut Tower Bars are made from ultra strong and lightweight AL6061 and offer the highest strength-to-weight ratio of any strut bar on the market. Each bar is highly polished and features anodized aluminum brackets and a Skunk2 nameplate. The performance of the Skunk2 Strut Tower Bar is further enhanced when used in conjunction with other Skunk2 suspension components such as Skunk2 Lower Tie Bars, Lower Control Arms, and Camber Kits.